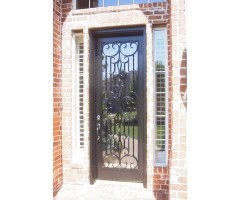 The double door scrolled ironwork, and the bordered center design on the lower solid panels make this a classic door for any style. 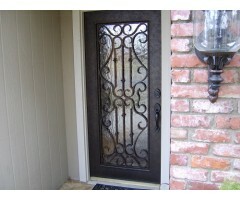 The ironwork on the window above is a beautiful addition to the added interest of the entrance. .. 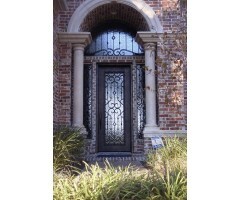 The bronze tone on this 4 section custom iron entrance creates a warm welcome. 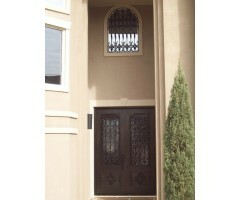 The design and the details with an accented medallion make a fabulous first impression! .. This contemporary custom side door was designed to compliment the client's custom flooring. The wavy steel accents and vertical bars with stratigically placed collars and hand forged nails created a unique work of art. Note: A main entry door (and a quarter) was also designed for this home adding textured glass to the mix and using a pivot system verses hinges. Also, a driveway gate was built in the same design. .. This home radiates architectural detail and glamour in every sense of the word. The ironwork is no less spectacular. 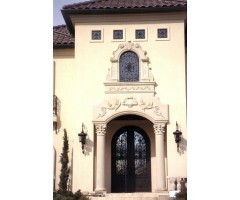 We built an arched double door with solid panels on the lower sections with detailed accents centered on each panel. The decorative details are complete with 4 medallions on each door. The windows above the door are equally spectacular. .. Designed with visual continuity and privacy glass this door not only offers beauty, but also security and value to your home. 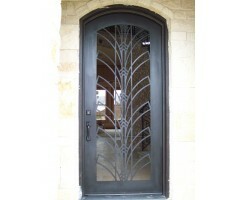 ..
Art Deco style this beautiful arched entry door is the first work of art that welcomes the home owner and guests. .. The beautiful arch and columns are the perfect frame for the intricate iron details on this front entry door, side lights, and upper window. Privacy glass was used on this entry to allow light into the home without compromising privacy and allowing the beauty of the ironwork to show through the glass without having to put window treatments up. .. The scrolled ironwork we designed for the side lights and front entry door on this project added elegance and value to this home .. This classic design is impressive with the scrolls on the top and bottom and the square vertical bars between. 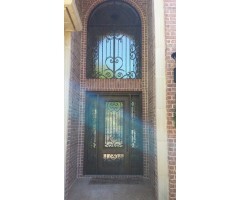 ..
Classic in design, mirror imaged upper and lower sections and placing a beautiful center piece on this door it made a beautiful statement for the entrance of this home. 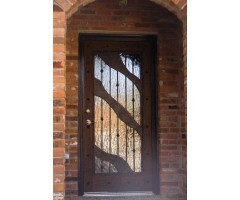 ..
First and last impressions - this is what your front door does for your home. This beautiful front entry door with sidelights and large upper window complete with custom iron makes the kind of memory we all want to offer our guests when they arrive and depart. .. This door is unique in the sense that we didn't use a solid panel on the bottom, but instead created a small lower section with the privacy glass behind. This was repeated on the two sidelights. The large upper window was designed to compliment the door with two large scrolls in the center creating the shape of a large heart. This entrance openly displays the love in this home. ..